Pakistan requires $40 billion to meet its nationally determined climate and mitigation targets (NDC) by 2030, says Malik Amin Aslam, Minister for Climate Change. 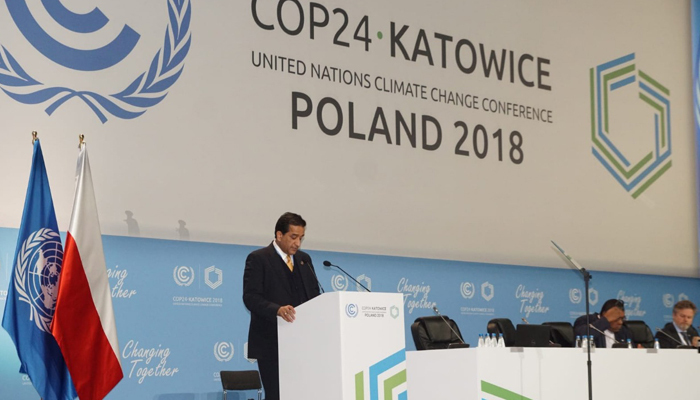 Aslam’s comments during an address at the ongoing summit of the United Nations Framework Convention on Climate Change (COP24) in Katowice, Poland. Pakistan ranks 135th in terms of its contribution to global emissions, yet it has been among the top 10 vulnerable countries consistently over the past two decades. The NDC is a binding action plan to control greenhouse gas emissions and adapt to climate change impacts. Countries voluntarily committed to them under the Paris Agreement in 2015. According to the Global Climate Risk Index 2019, between 1998 to 2017, over 10,000 people have died in Pakistan due to climate change impacts and it has lost upwards of $3,826 million. In 2017 alone, 262 fatalities were reported. “That Pakistan has a share of less than one per cent in global emissions underscores the unfairness that also becomes apparent,” states the report. Under the NDC, some of the pledges Pakistan has made include rapid development of hydropower resources, mass transit systems in large cities, afforestation and reforestation and increase in capacity of existing large water reservoirs and dams. One solution, identified by the minister, was low carbon economy. “Pakistan has planted a billion trees to not only meet its pledge of restoring 3.48 million hectares of forest but has today significantly enhanced it by restoring over six million hectares of forest.” The project, according to Aslam, created half a million jobs, revived forest biodiversity, engaged the indigenous communities and energised the youth.